I’ve had my Instant Pot (electric pressure cooker) for about six months now. I’m sure you have either seen other bloggers, a friend, or a family member rave about how great they are. If you are anything like me, you have probably heavily contemplated whether or not this small appliance is really worth it. Just the way smart phones changed your life in ways you hadn’t even imagined, the same is true for the Instant Pot. This small and convenient appliance will change the way that you cook and look at cooking for the better. My favorite aspect of the Instant Pot is how much time it saves me when preparing meals for my family. Meals like, chili, that would normally need to simmer all day can be ready in as little as a half an hour. I love how quick and convenient the Instant Pot is. I also loved that I was able to toss out other small appliances and declutter my cabinets because the Instant Pot replaces their purpose. For example, I no longer need a separate rice cooker because the Instant Pot does a fantastic job of perfectly cooking all varieties of rice (my personal favorite is jasmine). 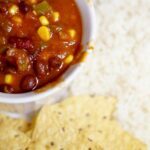 Get dinner on the table fast with this hearty Vegetarian Chili recipe that is made in an Instant Pot. 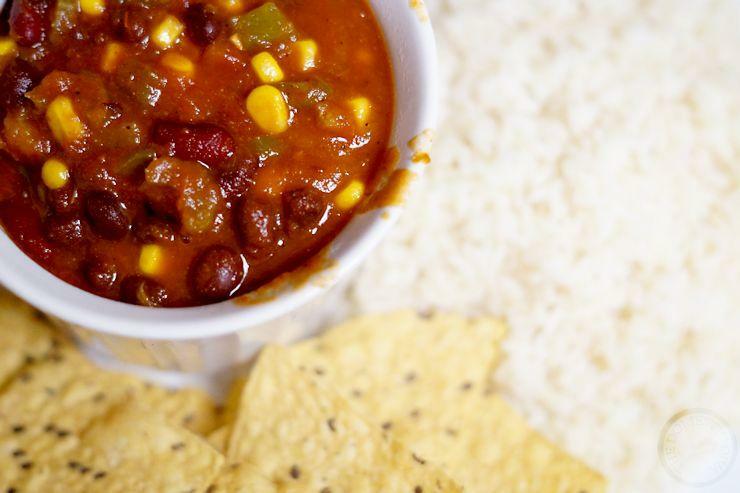 Forget simmering all day, this vegetarian chili recipe goes from electric pressure cooker to your table in less than an hour. Add all of the ingredients into the Instant Pot or electric pressure cooker. Close the lid and set the valve to sealed on your Instant Pot to retain pressure while cooking. Press the bean/chili button on the Instant Pot or on an electric pressure cooker select the high pressure function for 30 minutes. Once the cook time is complete, use the quick release valve until all steam has been released from the pot before removing the lid to serve. Top with your favorite type of cheese if desired. Best served with a side of rice (like jasmine or parboiled), tortilla chips, or saltine crackers. Not a Vegetarian? Looking for a Meat version? 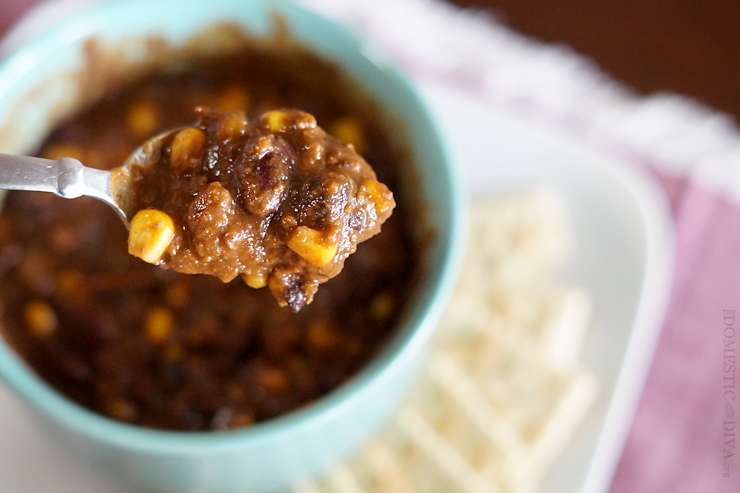 Not to worry, check out this Southern Chili recipe that you can make in the crockpot. There is no better comfort food when the cold weather hits. Curious what we eat in a day? Figuring out “what’s for dinner” doesn’t have to be complicated, tune in every week on our “Vegetarian Family Lunch & Dinner Meal Plan” page as I share 7 made-from-scratch family lunch & dinner ideas and 1 dessert recipe. Grab meal ideas, family favorite recipes, and subscribe to our meal plan on Google Calendar to make lunch and dinner a little bit easier for busy moms on a budget. Ah this is definitely something I want to try once it gets a little chillier out here! Looks so good! Perfect for a Meatless Monday! This looks delicious. I’ve added it to the list! Just made this as my first Instant Pot meal and wow! What a flavorful dish!! This is so great to hear, Nathalie. Thank you for coming back and commenting. I’m so glad you enjoyed this recipe! Made it and it was delicious! Definitely keeping the recipe! Thank you! That is so great, Cindy. Thank you for coming back and commenting on how it turned out. I’m so happy to hear that you enjoyed it. Just made it for dinner and this was so quick and delicious! Thank you! You are so welcome, JoSue. I’m glad to hear that you enjoyed it. Thank you for rating the recipe. Have a great night!